This three-part song, De roep van de strate, is published in the collection Oude en nieuwe liedjes (Old and new songs) put together by the physician and literary man Ferdinand Augustijn Snellaert (1809-1872). Snellaert published numerous literary-historical works and was, just like many nineteenth century linguists, a collector of folk songs. In 1848, he published Jan Frans Willems’s collection Oude Vlaemsche liederen (Old Flemish songs) posthumously and in 1852, he published his own collection titled Oude en nieuwe liedjes, of which in 1864 a ‘second enlarged edition’ was published. In the introduction Snellaert writes that the score of De roep van de strate was given to him by an important family from Ghent that had moved to Brussels. The name of the family could not be retrieved. The genre of the street- or market cries already originated in the thirteenth century and goes back to the partly shouted, partly sung slogans of market vendors and street-traders. These ‘cris de la rue’ inspired Clément Janequin (1485-1558) to compose the four-part chanson Voulez ouyr les cris de Paris (Hear the calls of Paris), which was published by Parisian publisher Pierre Attaingnant around 1530. The genre of the polyphone chanson was especially suited to evoke the simultaneousness of the cries. After a brief introduction in which the singers question the listeners and ask them whether they want to hear the ‘cris de Paris’, there are about forty calls of traders and craftsmen. 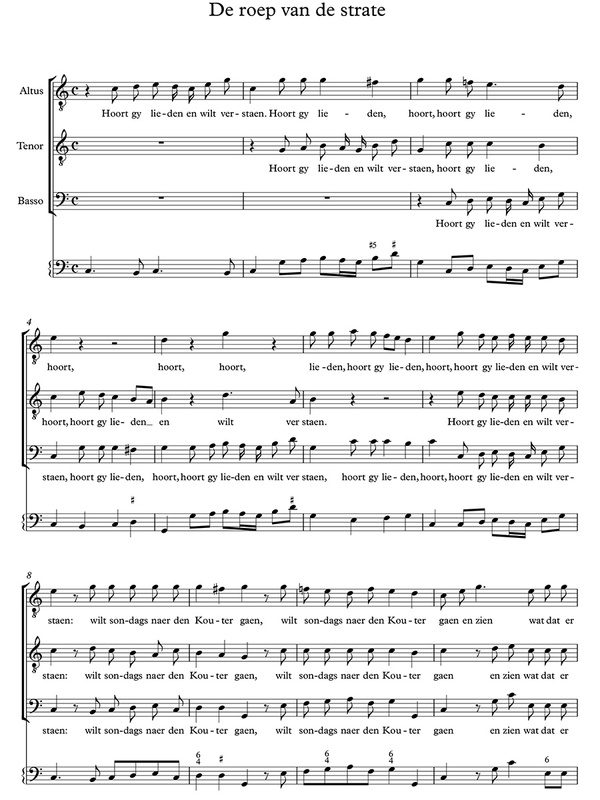 The last verse (‘Si vous en voulez plus ouyr, allez les donc querre!’, ‘If you want to hear more, then go look for them!’) reminds the listeners that this is merely a partial and aleatoric representation of the hustle and bustle on the streets. Janequin’s lively soundscape of the activity in a city like Paris would later be the model for similar pieces, such as La fricassée (1538) by Henri Fresnaux (?-1554), the anonymous Chanson nouvelle de tous les cris de Paris (1571) or La fricassée des cris de Paris (1578) by Jean Servin (1530-1596). In other cities, this genre existed as well, just look at The cryes of London by Orlando Gibbons (1583-1628). In this soundscape of London, Gibbons evokes almost an entire day out on the streets, from three a.m. until midnight, using five different voices and five viols. Thomas Weelkes (1576-1623) and Richard Dering (ca. 1580-1630) also put London street- and market cries to music. In the nineteenth century, the genre sparked the interest of literary men, folk song experts and music historians. 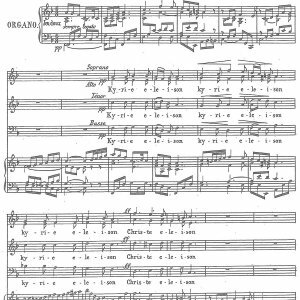 In 1857, the French musicographer and composer Jean-Georges Kastner (1810-1867) published his interesting study Les voix de Paris (The voices of Paris), which he ended with his very own version of the street cry: Les cris de Paris. Grande symphonie humoresque vocale et instrumentale (The cries of Paris. Great humourous vocal and instrumental symphony).